Lymphedema is a serious and debilitating disease that can cause significant swelling, pain, and potentially ulcers in patients. Lymphedema and similar venous insufficiencies can cause significant swelling in the upper and lower extremities. Cancer victims many times encounter this disease. 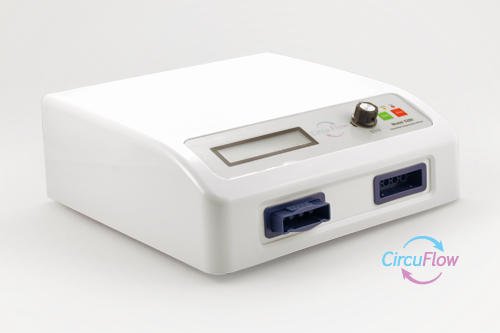 The CircuFlow™ 5200 allows patients the freedom to treat chronic venous and lymphatic disorders in the comfort of their own homes. Using intermittent gradient sequential pressure applied through multi-chambered garments, the CircuFlow™ 5200 increases blood flow and provides extracellular fluid clearances. 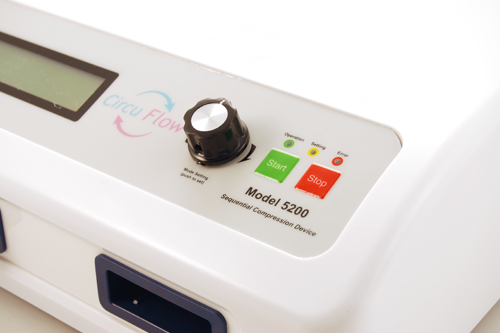 The CircuFlow™ 5200 can also operate in two modes: A gradient mode in which a maximum pressure and pressure gradient are administered, and a pressure mode in which each chamber’s pressure can be set individually. Open the shipping box and lift device up and out of box. Check to make sure the box also contains 1 power cord, 1 air blocker, and a user manual. Remove the protective foam covers on each side and the plastic bag. Place the device on a ﬂat and stable surface near the patient. Unwrap the power cord (from the box) and plug it into the back of the machine. Plug the device into a safe and properly grounded outlet. 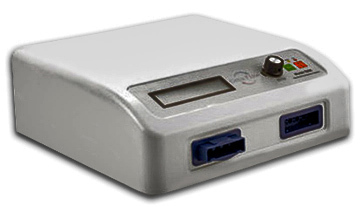 Attach left and/or right quick connectors of the garment to the quick connect ports which are located on the front panel of the device. During a single garment session (i.e. left only or right only) insert the air blocker into the unused quick connect port. For leg garments, unzip the garment all the way to the end. Place the foot at the bottom of the garment and pull up the zipper while supporting the garment to wrap around the leg. For arm garments, slide the arm through the internal cavity of the garment. Factory Default Mode: Device comes with a factory default setting providing 45mmHg pressure on distal chamber and a 7% of gradient pressure, and a 30 minute treatment time with a 30 second cycle time, with no chambers being skipped. Gradient Mode: This mode allows you to set your starting pressure and the percentage drop of pressure gradient between chambers. Pressure Mode: This mode allows you to set the pressure in each of the four chambers in the sleeve.